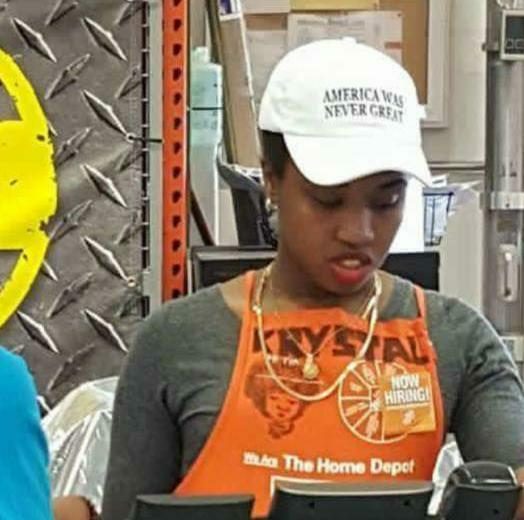 Did a Home Depot Employee Wear an 'America Was Never Great' Cap? Did a Home Depot Employee Wear an ‘America Was Never Great’ Cap? A controversial photograph showecd an employee at Home Depot wearing a cap bearing the slogan "America Was Never Great." Krystal Lake, 22, of St. George, was spotted wearing the controversial hat during her shift at Home Depot, located on Forest Avenue in Mariners Harbor. Lake, a lifelong Staten Islander and student at the College of Staten Island, said this was the first and only time she had worn the hat to work, and that she was not reprimanded by any manager for the decision to wear it. Lake, a Bernie Sanders supporter, said she has seen other employees wearing pro-Trump pins and pendants on their uniforms — yet no one has ever told them not to wear them. Lake said she has received dozens of death threats on her social media accounts. “People have been saying really racist things to me and that they’re going to come and find me,” she said, “and that what I said is disgraceful and I hate America — but I don’t hate America.